A WEST Lothian MP has urged victims of the collapse of Christmas savings firm Farepak to claim compensation payments. Last month, it was announced by the firm’s liquidators that payments of 32 per cent were to be made to people who lost out due to the company’s demise in 2006. The sum is in addition to the 17.5p in the pound given by the Farepak Response Fund charity after the firm went bust. 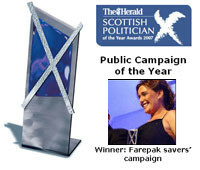 The result followed the high-profile Unfairpak campaign, led by Suzy Hall of Morningside. Livingston MP Graeme Morrice said: “Farepak victims have been waiting six years for compensation and, while I know some will be disappointed the payment is not higher, they will now receive around half the money they lost.